The original hall was officially opened by Lieutenant Colonel Bruxner Anzac Day 1921 to commemorate those who died in service or were killed in action during World War One. It was destroyed by fire and a new hall was built and officially opened by Mr. W. R. Cooke on the 13th April 1935. This hall was destroyed by fire on the 21st November 1954. The hall was rebuilt and is also known as the Bonalbo and District Community Hall. Bonalbo citizens are awaiting the decisions and plans from a special "ways and means committee" before proceeding to build a new hall. Mr. S. C. Benton, chairman of the committee, said yesterday: "We have met regularly and discussed the various aspects of building a new Memorial Hall. A general plan has been agreed upon and preliminary costs to cover different building materials are being prepared. "Many generous offers of standing timber have been made by 'big' minded men with the interests of the district at heart. Offers to cut the timber free have been made by the proprietors of the local timber mill and mill hands have offered their labour. Cash donation promises are being made and there are prospects of interest-free loans. The committee is giving serious consideration to these offers and it looks as if with a little more effort, we will be able to rebuild quite soon," Mr. Benton said. "If every man with a few suitable trees is willing to donate them for the purpose, we have the men willing to carry the logs to the mill, and the hall built in this true pioneer manner would be a very real and worthy tribute and a real 'soldiers' memorial hall'. "But many more offers will be necessary,'' said Mr. Benton, "before this scheme is possible." Northern Star (Lismore, NSW), 16 December 1954. KYOGLE, Wednesday.—An application will be made by Kyogle Shire Council to the Minister for Local Government for a grant towards the cost of rebuilding the Bonalbo Memorial Hall, destroyed last month by fire. 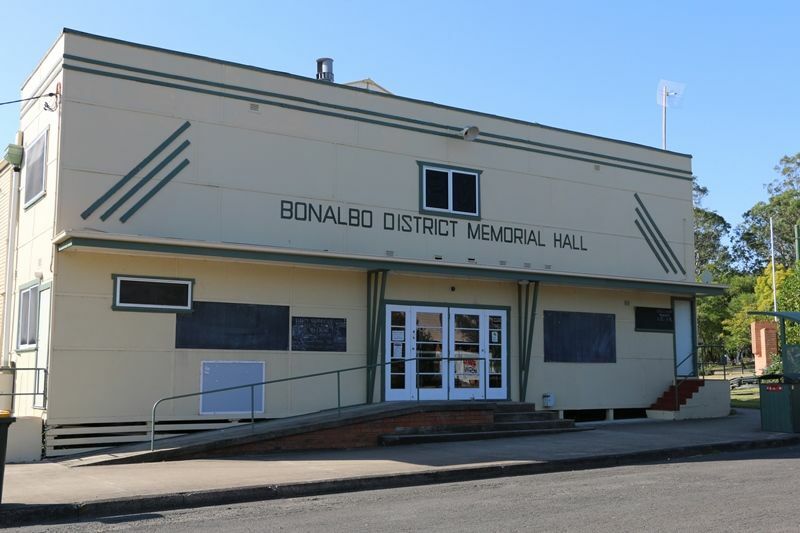 A letter from the Bonalbo Memorial Hall ways and means committee asked the council what facilities might be available to assist in erection of a new hall. Cr. P. E. Petrochilos said it was thought that the council might be able to get a grant from the Minister for Local Government on a £1 for £1 basis. It was realised, he said, that this committed the council for equal expenditure to the grant, but this was not important as the local committee would have ample funds to meet this expenditure and would do so. Council will take steps to do so.